We’re generally of the opinion that more is more when it comes to cake. A thick layer of buttercream? Yes please. 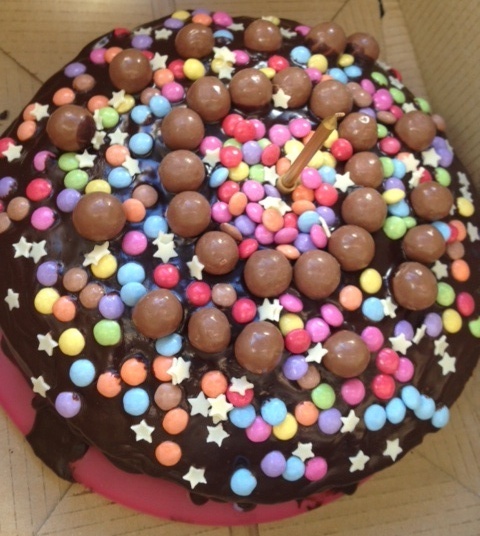 Smarties and Maltesers and stars and extra chocolate and a candle? Oh yes! Yes, yes, yes and YES! In fact, this totally amazing cake on the left here, which we’ve affectionately called the Explosion in a Sweet Shop cake, made by our baker Rose last year, is what we reckon kids would conjure up if they were charged with creating a birthday cake. The only way it could be improved would be to douse it in edible glitter. Glitter is always good, especially when a tiny fleck of it somehow gets indefinitely stuck to a serious person’s face and glints in the light every time they move, like the glitter equivalent of *JAZZ HANDS*! With this more is more approach in mind, you can imagine our excitement when we were taught how to make bows out of flower paste by the incredible SuperJess of Cakes4Fun fame. What can not be improved by the addition of a bow? Hair, clothes, presents, cakes. Stick a bow on them and they’re instantly propelled to another level of awesomeness. Those are the rules. And because we’re generous and want you too to be able to embellish your world with sugar bows we thought we’d bring you a step by step masterclass of how to make them yourself. Cool, hey? What you need, in an ideal world is a wonderful little invention called “flower paste.” We used Renshaws but we’re sure there are other brands out there that are just as good. 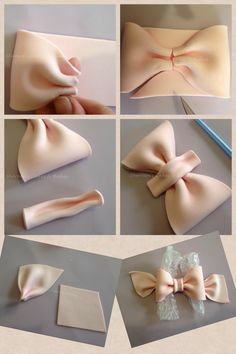 You can also make bows from sugarpaste or even fondant but they just won’t be as delicate. Flower paste is like chewing gum in terms of elasticity – you can roll it so thinly that you can read a newspaper through it, yet it still won’t break when you’re moulding with it. Magic! 1. Roll out a long narrow strip of your magical flower paste as thin as you dare. 2. Cut it into four equal lengths if you’d like to create the rather snazzy rosette style bow on the right (or thirds if you want to create a more traditional bow). 3. Take each piece and carefully concertina both the ends, folding them back and forth as many times as you’re able to. 4. Loop each piece in half to form the bow bits of your bow (are we just talking gobbledegoop now?! ), and use a little brush and some edible glue to stick the four pieces together as desired. 5. Create a little disk or embellishment to cover the joins, or if you’ve gone for a more traditional bow with two loops (as demonstrated in the picture on the left) then use your spare strip of flower paste to loop the two bows together. This is what we did, by the way – we obviously weren’t deemed up to the task of the four-loop bow! 6. Et voila! Repeat as many times as you desire. Go to town. 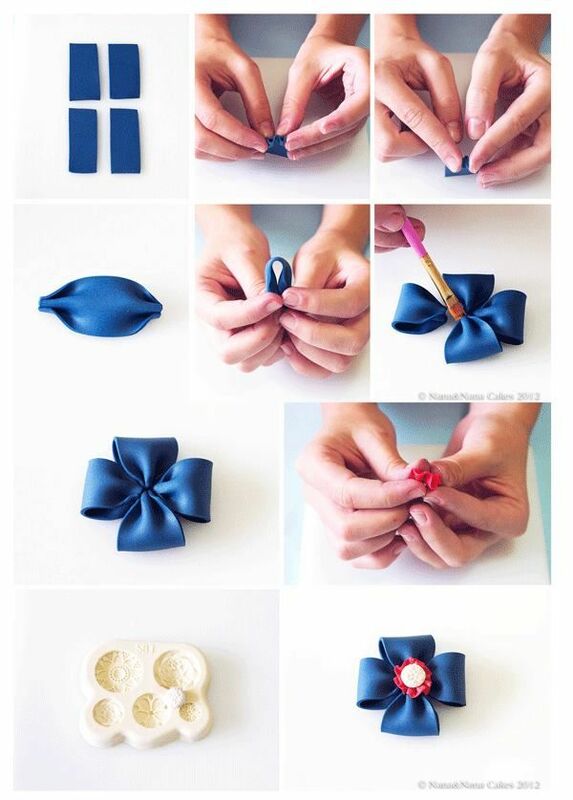 Go totally crazy and pop a flower paste bow on anything that comes remotely near you. Someone wants a superhero cake? Whatever. We’re pretty sure Batman can pull off a bow. Quite frankly, with all that tight lycra around we reckon a bow would be the least of his worries. And of course, as is the way of the world, someone’s explained it better over on the world wide web so go and Google images of flower paste bows, or check out a more professional tutorial on YouTube, but just promise us that ‘more is more’ will be your mantra when it comes to cake.